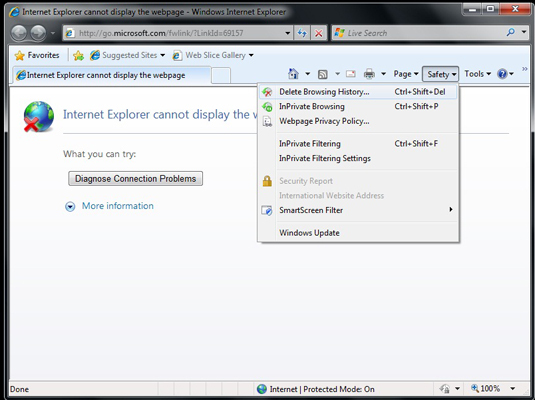 Internet Explorer 8 has been loaded with new safety features, such as the SmartScreen Filter, to protect you and your privacy. You can use the SmartScreen Filter to check Web sites to see if they have been reported to Microsoft as generating phishing scams or downloading malware to computers. Remember, the Internet can be a dangerous place — a place where people try to get at your private information and make nefarious use of it. IE’s new safety and security features can help you stay safe. Click the Safety button and choose SmartScreen Filter. SmartScreen will start monitoring the Web sites you visit so that it can warn you about potential problems. Go to a Web site you want to check. Click the Safety button and choose SmartScreen Filter→Check This Website. 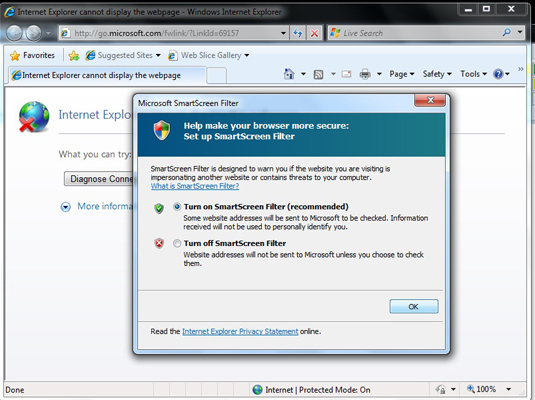 The SmartScreen Filter window appears, indicating whether it found any threats. Hopefully, you’ll see the message shown here. When turned on, SmartScreen Filter automatically checks Web sites and generates a message if you visit one that has reported problems. However, the automatically generated reports only get updated periodically, so if you think a site might be fishy, order SmartScreen to Check This Website and you’ll get the most up-to-date information.